Jungle Red Writers: Two Words that will Change Your Life: Bacon. Jam. JULIA SPENCER-FLEMING: Yesterday in the comments, Jungle Reds' own Joan Emerson mentioned the words "bacon jam," and you know I was all over that idea. To me, there is very little bacon doesn't go with; corn bread, pancakes and maple syrup, almost every single soup I make - I've even tried that sweet carmelized bacon candy and my God it tastes good. I'm very grateful that Joan is willing to share her bacon jam recipe with us today. Cook the diced bacon over medium heat, stirring as needed, until the bacon just begins to turn crispy, about fifteen minutes. Remove from pan. 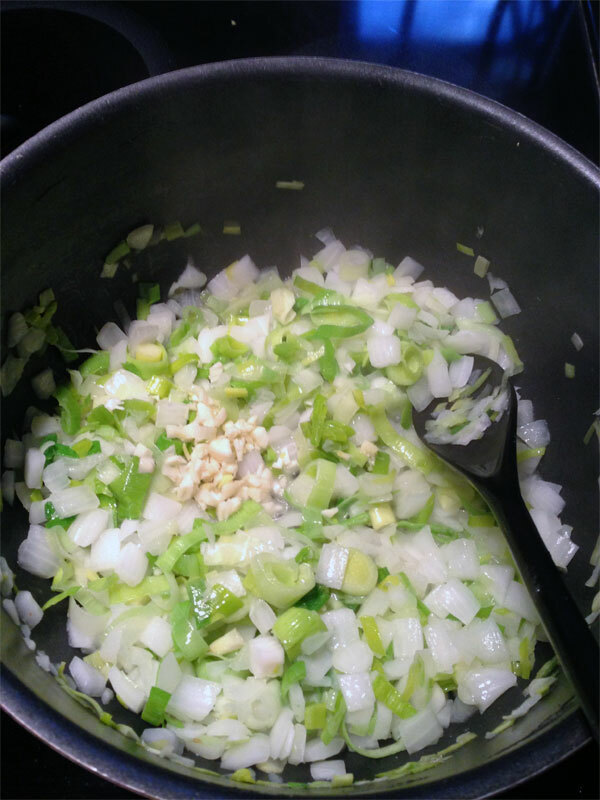 Cook the onions, leeks, and garlic in the bacon grease, stirring as needed, until they soften, about five minutes. Add the brown sugar; return the cooked bacon to the pan; season with pepper, cayenne pepper, liquid smoke. Add the coffee, balsamic vinegar, and half a cup of hot water. Bring to a boil. Cook over low heat for about one hour, uncovered, stirring occasionally. Add a small amount of water if mixture becomes too dry as it cooks. 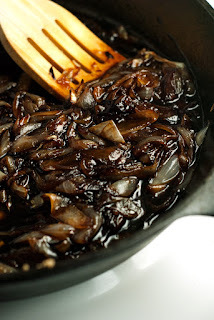 When mixture is thick and onions are caramelized, remove from heat. Cool slightly; transfer to food processor. Pulse a time or two to obtain a thick, chunky consistency, like a chutney or a tapenade. The above recipe is the one I regularly use, but the recipe can be adapted to suit individual tastes. Thanks, Joan! Who's up for trying this with me? Just thinking, seeing the photo of that luscious sandwich, that having bacon jam in the fridge might change up potential mealtimes, even when there isn't any actual bacon in the house. Because with only the two of us here, we try to limit our exposure to the stuff. 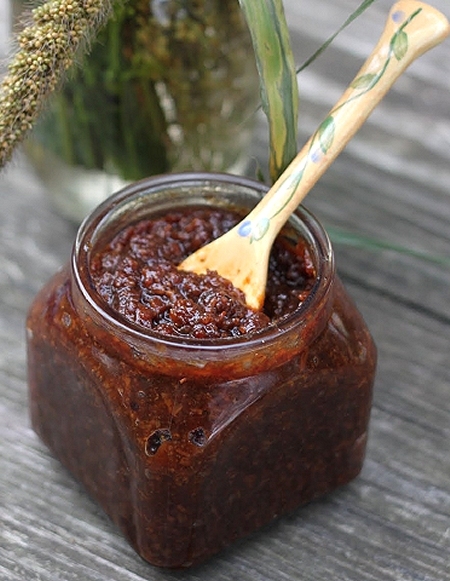 oh Joan, you've left us drooling for bacon jam on Sunday morning...this looks amazing and Karen is right, perfect to have on hand just for a taste of forbidden bacon! I'm a big proponent of the "bacon goes with anything," but I think this might be a bridge too far. I think I'm in love. Thanks, Joan and Julia! My sister will try this. Four cups of jam. Four sisters. Perfect! Joan! Did you hear me calling you in yesterday's blog? Oh my goodness, I am swooning, absolutely spooning. I really want some. Could someone make some and send it to me please? The dictating system changed the second swooning to spooning. But I'm leaving it! I just received a gift, by the way, of lemon marmalade. I used it to make lemon marmalade garlic sauce for grilled swordfish. And it was fabulous. Hank, I bet it was amazing. What a great idea. Thank you everyone for your kind comments; I hope you all enjoy the recipe and the jam! Mary, despite the temptation to put bacon in everything, we're pretty good about not overdoing it. Having the jam on hand is great for adding just a small amount when I'm making something and want just a hint of bacon. I've noticed that bacon jam is slowly making its way into restaurants . . . TGI Friday's offers it as a condiment on one of its burgers. And, although we like it on burgers [or most anything else], I find we most often use it in cooking. Hank, I used to make lemon marmalade when we lived in California and had Meyer lemon trees in our back yard. Your lemon marmalade garlic sauce sounds delicious. Oooo. Since becoming a vegetarian, there are a few things I miss. Scallops swimming in garlic butter. Bacon sandwiches. Crispy bacon with all the grease oozing into the soft white bread (which I never eat either). I may have to put on a disguise and go buy some bacon. Joan, I am SO making this! WHEN I FINISH THE BOOK. And, Hank, will you give us your lemon marmalade garlic sauce recipe? Yum. I'm so sorry; I should have thought to tell you that! The bacon jam will keep, refrigerated, for three weeks or so [if it lasts that long]. It also freezes very well, but, unlike fruit jams, home canning is not a safe option for bacon jam. When I make a batch, I usually keep half in the refrigerator and freeze half [or give the other half away]. I am going to have to try this Joan. I can see it spread on lightly toasted bread with lovely sliced tomatoes. A new version of the BLT. Pat, if you warm the bacon jam in the microwave for about a minute, it will spread easily without tearing the bread. Oh, wow, Joan! You had me at bacon grease! 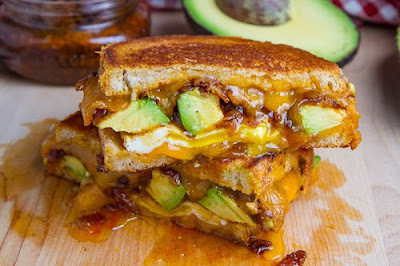 I was thinking that the bacon jam sounding interesting, and then you showed that beautiful sandwich picture and listed other ideas for using the jam, and I realized what a genius idea bacon jam really is. 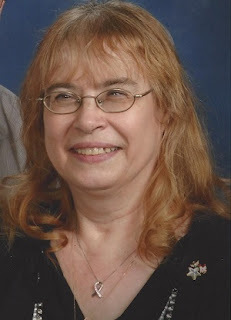 Kathy, I have no idea what imaginative mind came up with the idea for bacon jam, but it was definitely a genius moment. And Julia gets the credit for finding the pictures . . . . There's no recipe, since I made it up on the spot. But--I sautéed minced garlic in Meyer lemon olive oil, then added a bit of flour to thicken, stir stir stir quickly until the paste forms, then deglazed with white wine. When It was halfway thickened, I added some glops of the lemon marmalade, making sure to include the chunks of lemon. Salt and pepper. It was beautifully thick, but a tiny bit too sweetish, so more pepper. Then a bit of cream to soften the feel. And fabulous! Turkey, avocado, bacon, lettuce, tomato and bacon jam on toast. "The Joan"! I think you may have hit on it with the "Joan" sandwich, Hank. Next month we'll be getting beautiful fresh tomatoes from our organic farmers. Usually I just make Miracle Whip and tomato open faced sandwiches, but this summer, I'm going to go with the "Joan"! Oh, wow, my very own sandwich . . . thank you! That does look good. I'd be more skeptical, but Cyrano's already introduced me to chocolate-covered bacon. I freeze bacon spread out so I can just take a half-slice at a time (sin moderately), but this appeals as an alternative. I wrote a blog for today and included one of my dad's stories, about bees, so now wanting honey. What a sweet story. Memories are such special things . . . thanks for sharing. If I wasn't in book jail I would make this tonight. THANK YOU for sharing this recipe. Wowsa. Hurray for "the Joan!" Cannot wait. My grandfather Jean used to make maple-bacon crêpes whenever I visited. He'd cook the bacon then pour the batter over it to cook. Maple syrup all over. When the girls were small, we used to make cornmeal waffles [a recipe out of the Joy of Cooking] with bacon cooked right into the waffle . . . served with maple syrup over the waffles, of course. I left out the filling: Cottage cheese with chopped onion. I probably forgot it, because I don't know anyone else who does that to their crêpes. One time my mother and I went to a Pancake House for Saturday breakfast and ordered crêpes. We were very disappointed to find the filling was sour cream. Later someone told my mother that her father used cottage cheese because sour cream cost too much even if they could find it during the Great Depression. We had a good laugh but continued the cottage cheese tradition. I've never heard of filling crepes with sour cream, Reine. We always fill them with ricotta cheese and serve sour cream on the side. I guess there are about as many traditions for crepes as there are people who make them. Thank you, Julia, for the opportunity to share bacon jam with all the wonderful Jungle Red bloggers. Thank you, everyone, for your comments . . . happy jam-making!